I love squash and find joy in the opportunity of finding so many different varieties throughout the year at farmers markets or produce stands (get out of the grocery store and expand your squash knowledge!). Both squashes are healthy for you, both are full of Vitamin C and winter squash is an excellent source of fiber (like that parka filling!) Squash is one of the oldest known crops dating back 10,000 years and Presidents Washington and Jefferson grew squash in their gardens-just some info for my history loving hubby! The term, Meatless Mondays (not eating any meat for the day) is a campaign to help the health of individuals and the planet. I recently completed a continuing education detox summit which gave the statistic: if we all did Meatless Monday for one day: 70 million gallons of gas, 3 million acres of land and 100 billion gallons of water would be saved! It’s just one day! We do it a couple days a week, although our days may vary as our schedule does. I was at one time a vegetarian so it’s easy days for me! One of the things I enjoy is not telling my husband it’s our veggie day and seeing if he even notices there is no meat. For the record, most of the time he doesn’t even realize it until I tell him…that’s the power and flavor of veggies. Here are two easy squash dishes that make great use of leftovers! 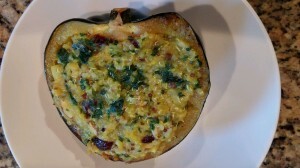 The first is spinach stuffed yellow squash (the picture on the cover page of this blog everyone keeps asking me about). Wash and dry and simply cut it in halve and steam. If you have a steam basket use it, if not, (buy one) or put it in a thin layer of water and steam until tender-about 8-10 minutes. Remove and let cool and drain. Scoop out the pulp, seeds and all into a bowl leaving the skin intact and add any leftover spinach and artichoke dip-that is best-a one stop shop. If you are not lucky enough to have any dip, simply add some steamed or creamed spinach (check your freezer aisle, they have some good microwave choices to stock up on) or gently sauté some fresh spinach in some olive oil. Stir in some garlic powder, black pepper, grated Parmesan cheese and a little shredded Mozzarella cheese (save some to sprinkle on top after cooking) and some diced artichoke hearts (optional). If you used creamed spinach, like the added flavor from some white wine, or just didn’t drain the squash fully, just add some bread crumbs to help thicken the stuffing. Mound the stuffing into the shells and bake at 350 degrees for 15 minutes. Sprinkle with some Mozzarella cheese and enjoy! First when choosing an Acorn squash pick one with a dull green rind, the more orange it has, the tougher the flesh will be. 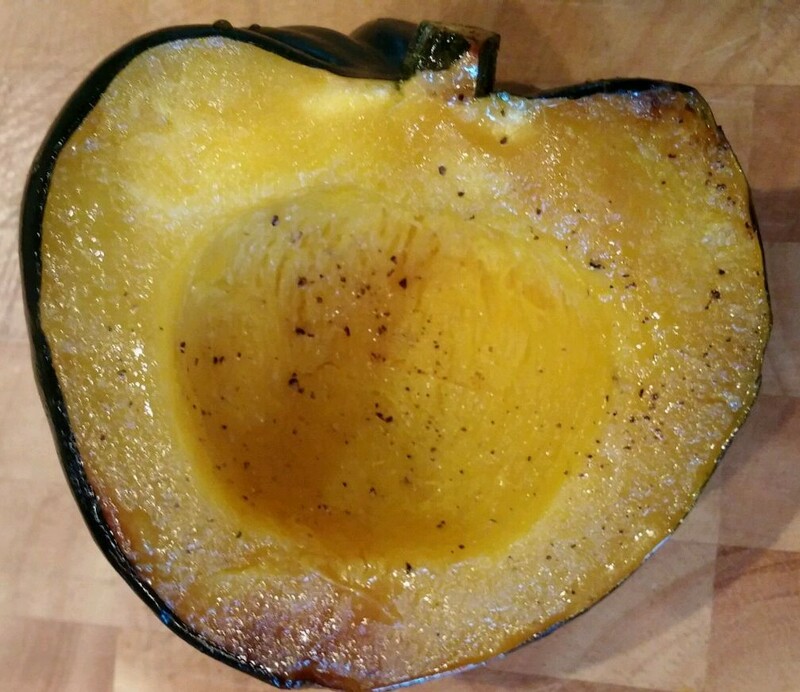 Acorn squash is very versatile and can be roasted and stuffed with just about anything! 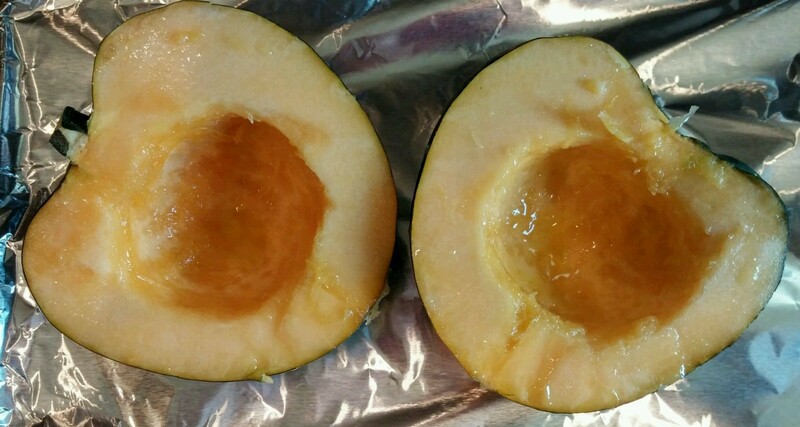 Wash and dry the squash and using a sharp knife (carefully) cut the acorn squash in half, end to end. It may help to gently rock the knife side to side to aid in the cutting. Once halved, use a spoon to scoop out the seeds and threads-DO NOT THROW AWAY THE SEEDS! Put some olive oil in the cavity and rub it all over the flesh of the squash. Sprinkle with some black pepper.Place it on a foiled lined baking sheet, cut side down, and cover with foil. Roast at 350 degrees for 35-45 minutes or until tender. 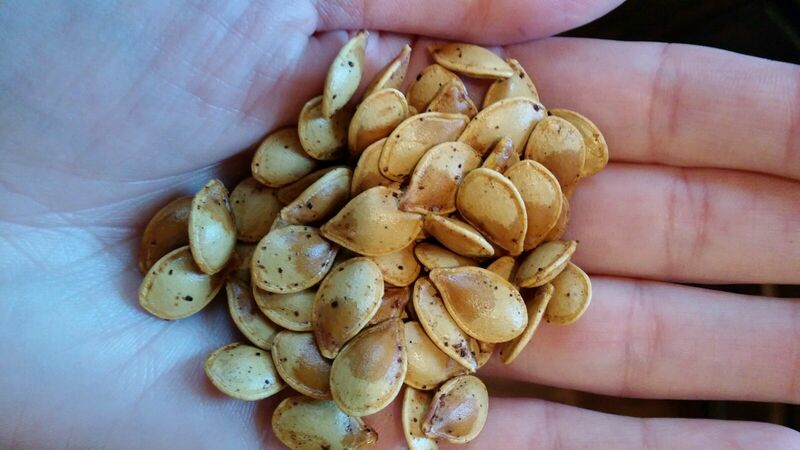 While the squash is roasting, take those seeds and pull seeds apart from threads, rinse, and set out to dry on paper towel. The drier the better for roasting. When dry, toss with some olive oil (or your favorite flavored oil) and your choice of seasonings. For example, as a snack, I like cayenne pepper, chili powder, and some salt free Cajun seasoning, but as a breakfast topping, I like cinnamon, brown sugar and hazelnut oil. Place in single layer on sheet pan. When you take the stuffed squash out the oven, lower temperature to 275 degrees and bake until golden brown about 15-20 minutes-you will smell their wonderful aroma alerting you they are done! 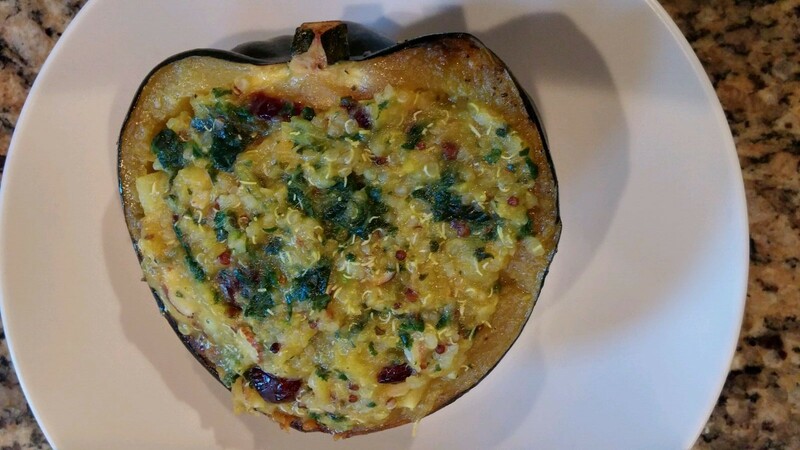 As mentioned, acorn squash is wonderful with just about anything, take stock of your leftovers. I scoop out the wonderfully roasted flesh and put it in a bowl to see what I can add. Today in the fridge I have some leftover quinoa (try it if you haven’t already-healthy and delish! ), one baked sweet potato, some kale (not enough left for a salad). Sounds good so far, but I double check my pantry. I am in luck. I happen to have some almonds and dried cranberries left from the last time I made chicken salad. Oh and I see an apple on the counter…certainly my hubby can sacrifice his snack tomorrow morning for dinner tonight! I cube my sweet potato and his apple and like building a Thanksgiving leftover sandwich, I just mix everything together adding some garlic and onion powder and black pepper (no need to heat anything). Fill the squash halves and put back on sheet pan, cover and bake at 350 degrees for about 20 minutes. Use a knife and fork and dig in, you can eat the whole thing, skin and all. 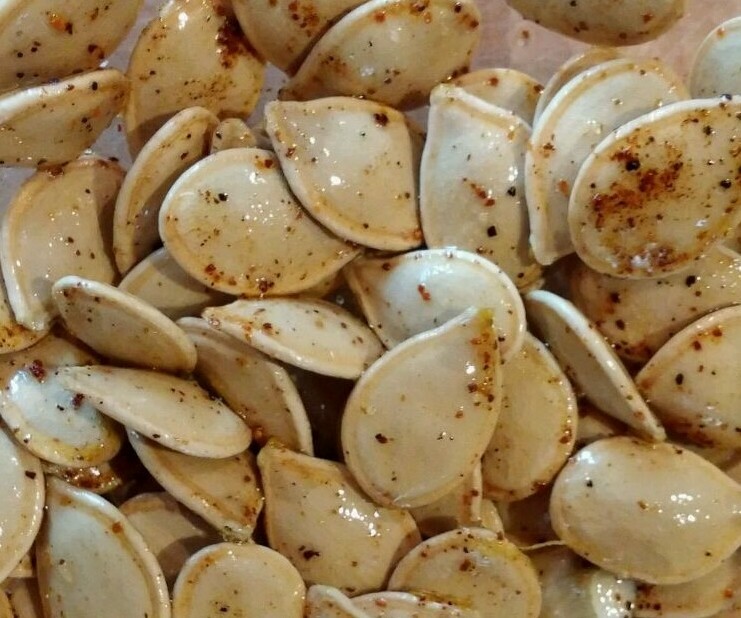 These squash are very versatile so I always roast an extra one to have for breakfast the next morning, it is delightful filled with oatmeal with some cinnamon and maple syrup (and don’t forget about the seeds). Luckily for me I planned ahead, it should help make up for the missing apple in the a.m. Put your TO COOK IS TO CREATE thinking cap on: On a non Meatless Monday, I have used leftover turkey taco filling with cheddar cheese in the yellow squash and jambalaya in the acorn squash. What other fillings can you think of for these two squashes? You can use zucchini for the yellow squash and butternut for the acorn. What other squashes could you substitute? FOOD FUN: Challenge yourself to try at least one new kind of squash! Now that all this talk about veggies and vegetables is done, here is some valuable info that you can use to win a bet…Squash is considered a Fruit, because of its seeds! So as Jimmy Buffett says, “…have a very fruitful day”! 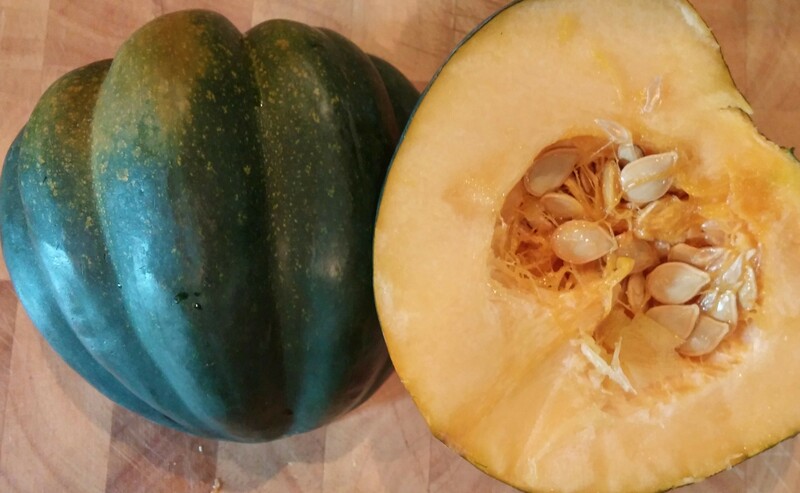 I am out the door…..can’t wait to buy my first squash! Thanks Susanne, for the very easy steps to preparing delicious squash dishes. I really never knew what to do with a squash….now I know. Love butternut squash and apple soup. That maybe my next challenge.